Boil the milk and let it cool until 45ºC. Boiling the milk is not mandatory, but I noticed that this makes the yogurt more creamy. Add honey and stir until disolved. Put 3 teaspoons of muesli on the bottom of each jar. I filled 9 jars of 150ml. 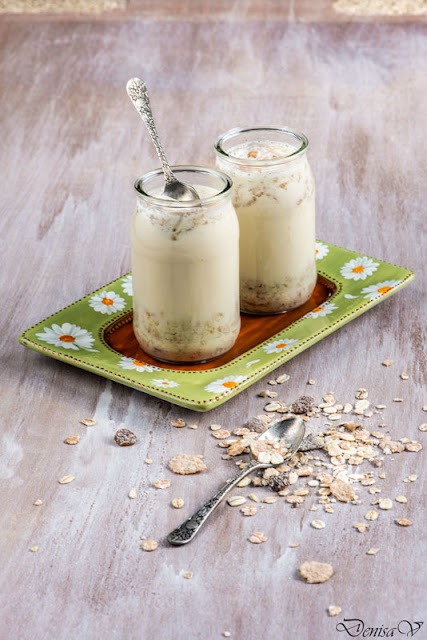 Pour the milk in jars over muesli. Cover the jars with plastic foil and secure them with rubber band. If you have jars with lids, you can skip this step. Put the jars into a cast iron pot. Pour warm water between jars in the pot, reaching maximum the level of the yogurt in jars. Cover the cast iron pot with its lid and put it in the oven at the lowest temperature (50ºC) for 3-4 hours. After this, let the oven closed and do not take the pot or the jars out for another 4-5 hours. Better to let them over night. If you use a yogurt machine you need to keep them at warm for 10-12 hours. Without a machine, the cast iron pot does a perfect work as well.